The Back Dr's Blog- Better Posture, Better Sleep & Pain Relief: Will You Get Back Pain? At the Back Dr's Blog, we specialize in pain relief the neck and lower back. Whether its helping you choose a better neck pillow or making a recommendation for a better pain relief product, we are here to help you with your individual needs. Will You Get Back Pain? Eighty percent of the population will experience back pain. When you are suffering it, it is extremely difficult to get comfortable. That is one big benefit of the Arc4Life Memory Foam Travel Twist Neck Pillow. Not only can you use it behind the neck or low back, you can put under the knees, or bend it for any part of the body or any position you are in. So don’t just pull the twist pillow out when you are going to travel on the airplane, but use it at home or elsewhere too. 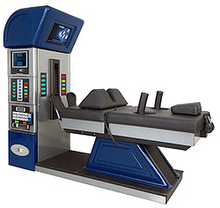 The Back Dr’s specializes in pain relief for the neck and the lower back. We will help you have better posture, get better sleep and help you be more comfortable. Helping you find natural remedies for your active lifestyle. Heat vs Ice for Lower Back Pain Relief? What To Do Immediately, If You Throw Your Back Out! At the end of this treatment, I no longer need assistance of a walker or a cane to get around..
"After abeing told surgery was my only option I was put in touch with another treatment called the DRX 9000. My pain was so bad, I could not do anything. After four treatments, I was able to stand up straight and walk again. I am now able to do almost everything I did before, and am enjoying the freedom I had before. At the end of this treatment, I no longer need assistance of a walker or a cane to get around. I am so thankful I had another option. Thanks to the Doctors and staff at CT Spine and Disc Center. I am doing very well. I must admit that, that given the pain level (10+) that I was enduring when I first came to your office, I was highly skeptical of a positive outcome with the DRX9000. Following the regimen of treatments that you prescribed, my pain level is now almost zero. Before coming to you, I knew that the road to recovery was slow, but thank God for this machine and your professional care. Very seldom will I endorse a product. In this case, however, not only do I endorse it, but I offer to any person who may be looking for help, the opportunity to speak with me in order to give them my first hand opinion of this "Miracle Machine" and your miracle skills. Thank you for that you both have done and I look forward to continuing the maintenance sessions. " "Approximately two years ago, May 2005, I was diagnosed with polymyositis. At which time I was put on steroids. It helped the pain some but I did not like the side effects, so I tried Physical therapy which only made me feel worse. After three emergency trips to the hospital and with xrays and MRI's I was told I had 3 herniated disks pressing on my sciatic nerve. I was not ready to take on surgery if there was an alternative and thats where the procedure at the Spine and Disc Center with Dr. Bellinger and Dr. Gill made all the difference in the world. On my first visit on Febuary 28th 2007- I needed a walker, my husbands arm just to get in the building. After the first two treatments I felt immediate results. The treatments were gentle and painless. For close to two years, I have had difficulty in walking, sitting or standing. Thanks to the technology and exceptional care from Dr. Bellinger and Dr. Gill- I no longer need my walker and my pain level has gone from a ten to a zero!! And I don't cry as much either. I highly recommend this procedure. A friend of my daughters suggested that I try this as he had wonderful results also. I would also like to compliment the receptionist Jessica for her efficiency and kindness. I mentioned to her, the Doctors should hang another sign outside the door saying "This is your light at the end of the tunnel"
CT Spine and Disc Center LLC, Glastonbury CT. Watermark theme. Powered by Blogger.